The general public is fast paced. This does not work when you are slow paced. To help, make all public employees working at the courthouse jog in place while doing their jobs whenever in the presence of a potential juror. *perception is everything. 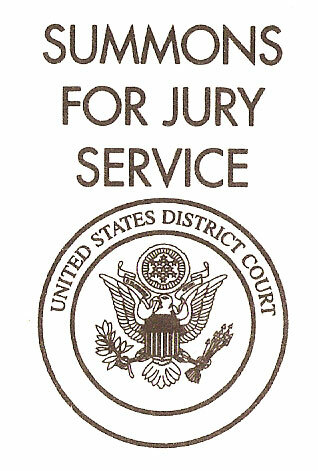 Instead of calling out names for jury selection, tape jury pool #’s under every chair in the room, have everybody countdown out loud from 10 and then look under their chair. When initial pool of potential jurors are selected, take them to a waiting room with colored walls, fish tanks, soft jazz music, magazines not older than 15 years, and offer free snow cones. When arriving at the courthouse to check in and go through security, have all of the people on trial that day set tables up next to the line and offer free face painting and cotton candy. Before entering the court room to begin the interview process, turn on really loud techno music and have the judge announce the entrance of each potential juror. When going through the security check point, give each potential juror only 10 seconds to empty all of their pockets, remove their belt, and walk through the scanner or they have to serve an extra day. When selecting first a group of potential grand jury candidates, hand them a microphone to share to all of us in the room their excuse as to why they cannot serve and then let everyone vote on who should serve based on their lack of believability. Hire a local lookalike of Christina Aguilera to begin each selection process with the National Anthem. Require anyone entering the jury selection room with a hot bag of fast food that they need to share it with all 149 of us or they have to serve an extra three days. Let everyone who made it to the interview stage get their picture taken wearing the judges robe sitting in his or her chair next to both the defendant and the prosecution for a souvenir photo. When do we get to put on those white haired wigs like they wore in 1776? What would you add to this list of ideas to spice up the experience? In the end, it should be an honor to take part in this process. But, sometimes, it might be nice if we could loosen up a little and have some fun. I hope to be posting my full experience on the Liquid Cloud Eleven blog in the near future. Next Next post: Why am I a Digital Media Architect and not a consultant? Create a theme park behind the courthouse for jurors and potential jurors. The defendants are the ride operators, prosecutors are the cashiers/ticket sellers/ anywhere money is taken, judges are the janitors, keeping the park clean, defense attorneys serve as maintenance any time a ride breaks down. You should run for office. I’d vote for you.